Last month we had written about Spencers ambitions to enter the bakery quick bite segment in India. Spencer’s JV partner is Au Bon Pain [Place for Good Bread] of the US. Au Bon Pain mainly caters into the easy and quick bite food segment. Stores typically serve breakfast and lunches such as soups, stews, sandwiches, sales, bread and bakery items, confectioneries and beverages. The JV will open its first store in the retail city of Bangalore / Bengaluru spread on a 2,000 sft carpet area. 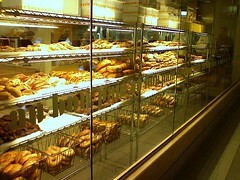 Au Bon Pain also operates in other Asian countries – Korea, Taiwan and Thailand.